Pictured above: Apolemia lanosa uses millions of tiny stinging tentacles to capture small animals. "sea squirt" that dances in the deep-sea current. 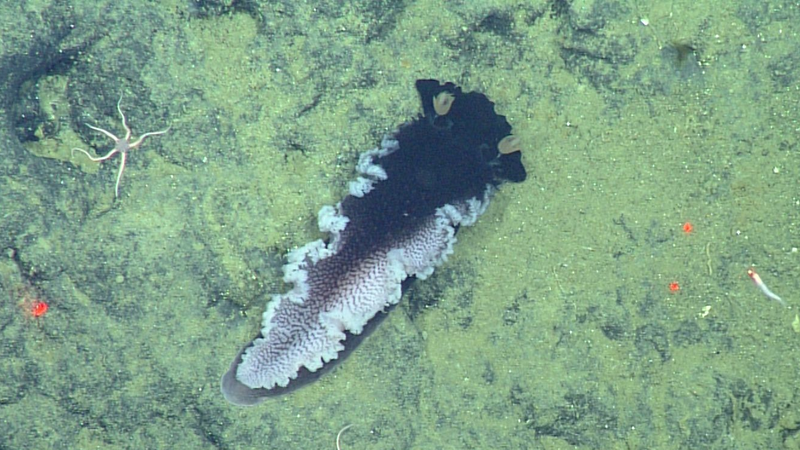 Five colorful marine slugs that slither along the seafloor. A tadpole-like animal that builds a big house out of mucus. Sponges shaped like parasol umbrellas. These are only some of the most recently described and named animals discovered by MBARI researchers. 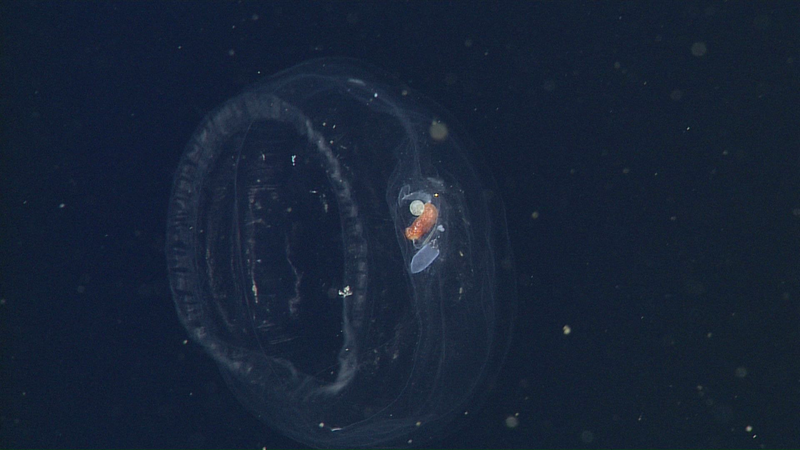 MBARI researchers regularly come across never-seen-before animals, which shows there is so much we don’t yet know about life in the ocean. During the past three decades, MBARI has emerged as a leader among the world's oceanographic institutions in the discovery of organisms that are new to science. To date, the institute has discovered more than 200 species, of which 170 have been formally described and named. These discoveries have greatly increased public awareness of how little we know about our planet. Each discovery provides one more piece to the puzzle of life, how organisms may rely on each other to survive, or how they are impacted by a changing ocean. 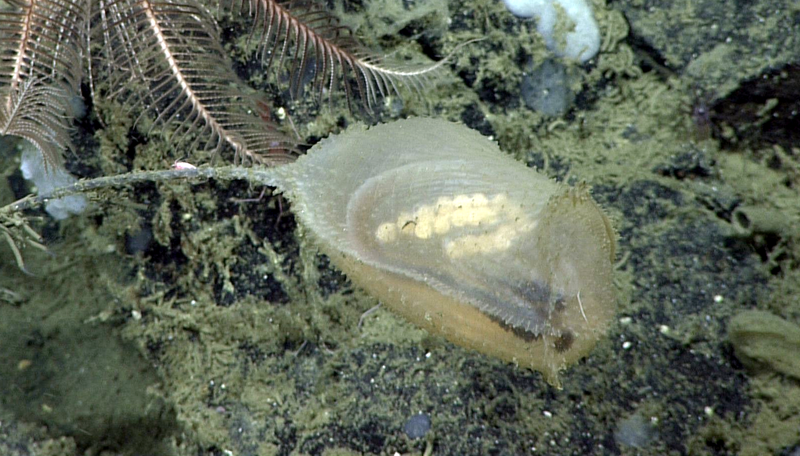 Tunicates like this are commonly called “sea squirts.” These animals live suspended a little above the seafloor so that they can capture particles of food from water currents that flow through them. 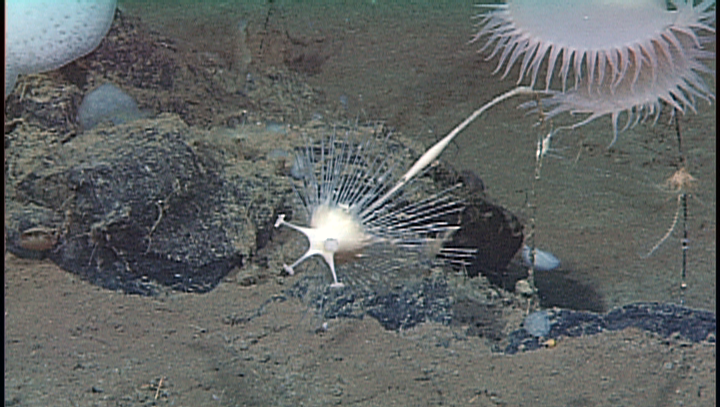 The species is named in honor of MBARI Senior Scientist James P. Barry, a benthic ecologist, who has contributed enormously to the study of deep-sea ecosystems. See video clip on home page of this annual report. Animals with unusual appearances or behaviors pique the public interest and help to serve as an entry point for engaging people about the sea and the importance of the ocean in sustaining all life on Earth, including humans. Our hope is that the more people know about the varied and abundant life in the ocean, the more likely they are to take an interest in the protection of this vast, essential ecosystem. 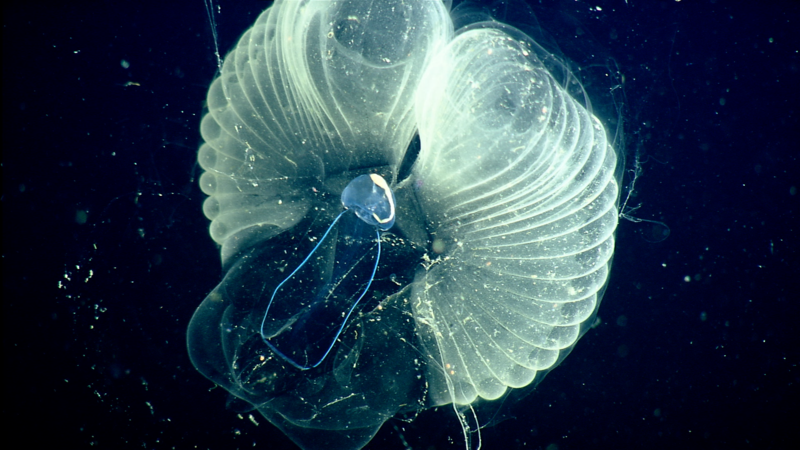 Work on undescribed species is part of MBARI’s effort to promote enhanced scientific understanding of the functioning of marine ecosystems, and to contribute to the David and Lucile Packard Foundation’s long-term goal to restore the health and productivity of the ocean on which all life depends. If we are to protect life in the ocean, we must do all we can to determine what lives there—we can’t protect what we don’t know exists. The continual discoveries of species never seen before is made possible by MBARI’s long-term investment in remotely operated vehicles (ROVs), imaging and sampling technology, and the Video Annotation and Reference System that contains information on every animal seen during thousands of ROV dives. When scientists see an unknown species during an ROV dive, they take the time to capture the best video possible of the animal in its natural habitat. The video record often shows how the animal behaves in relation to its surroundings as well as to other animals. If possible, they will also collect a sample of the animal with the ROV’s tools, so that they may better study the animal back in the laboratory. Once scientists have a specimen, a taxonomic expert will be asked to carefully study the animal’s features to confirm that it is in fact an undescribed species. 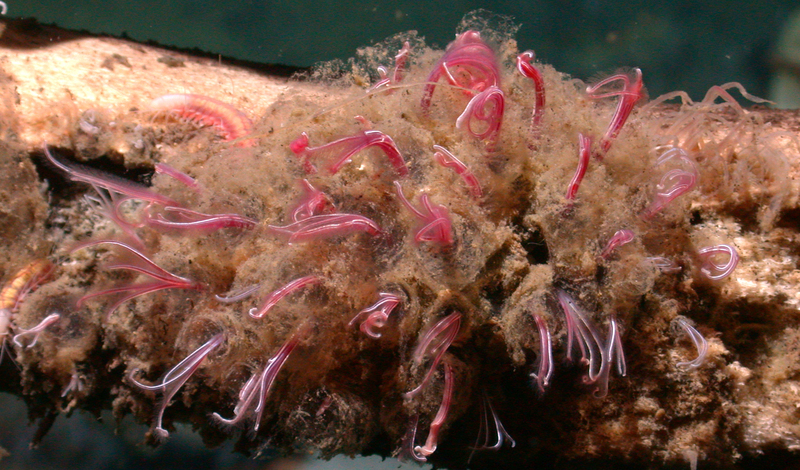 Several of MBARI’s own scientists are the recognized taxonomic experts in certain species. Other times, this expertise is found at other institutions. Scientists use both traditional “morphological” (shape-based) approaches to classifying organisms and newer molecular DNA analyses, which provide a different method for understanding how various species are related to one another. Such genomic techniques are especially useful for groups of animals that look very similar. DNA analyses have also shown that some animals that look similar are not closely related, but evolved similar traits independently. After confirming that an organism is undescribed, the discovering scientists typically get to choose a species name. Sometimes researchers choose a Greek or Latin word that describes features that make the animal unique. Other times they may name the organism after a colleague who has contributed to the research, an important figure in the field, or occasionally a celebrity. Scientists writing the description cannot name the animal after themselves. Even as MBARI scientists and their taxonomy collaborators painstakingly analyze and describe more species, science cannot keep up with many animals newly encountered at sea. Scientists estimate hundreds of thousands, if not millions, of species in the ocean are yet to be discovered. Continued exploration and diligence will help bring more of these animals to light. The journey to describe unknown species. Video by Linda Kuhnz. Detecting microbes in the open ocean, monitoring drinking water for toxins, and sampling for invasive species in coastal streams.